In recent weeks, I’ve spent hundreds of miles in the new Honda Civic Sport Touring Hatchback, as well as the new Chevrolet Cruze Diesel Hatchback. Both machines are prime examples of how carmakers are working, in various ways, to give shoppers more for their affordable-car dollars. 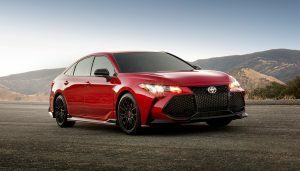 Lately, connectivity, safety, styling, and overall value are all being ramped up, proving that there’s probably never been a better time to buy an affordable car. So it made sense to also put together a Volkswagen Jetta review. 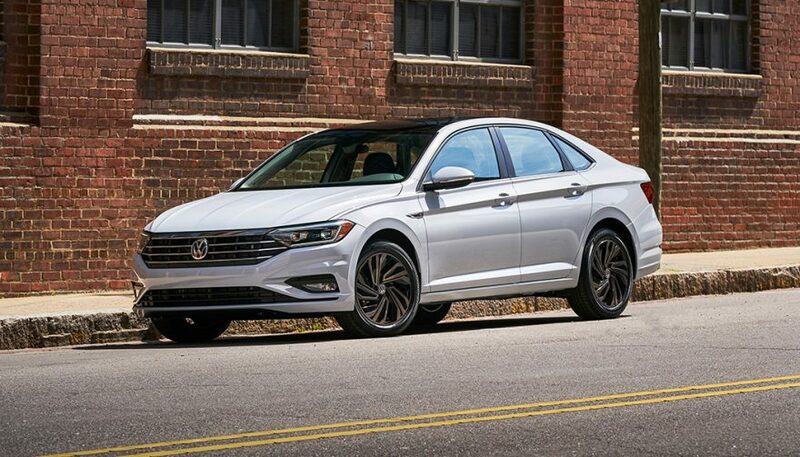 My most recent test drive was of the new 2019 Volkswagen Jetta. Though it’s not a hatchback, it is the same price as both the Honda and Chevrolet I drove one and two weeks prior, respectively. And, like both of those testers, the Jetta arrived in my custody in fully-loaded guise, with nearly-identical pricing to the fully-loaded Civic and Cruze. If you’re in the market for a fully-loaded version of a highly-affordable car, the new Jetta needs to be on your test drive hit-list. I’ll put the conclusion up here: this is about as good as it gets for today’s money, provided you’re not a performance buff. First, the new Jetta feels big. On board, drivers can stretch out, the other side of the cabin seems a mile away, and the rear seats are totally adult-friendly (even for bigger, taller guys and gals). 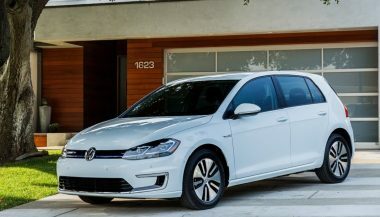 Plus, since Jetta wraps itself in a traditional sedan shape with a traditional beltline and roofline, there’s good outward visibility, lots of glass to visually open the cabin up, and no reduction to rear seat space caused by a sloping or daring roofline. Further back, the trunk is also monstrous: big, wide, and deep. The first time you open it, you might feel like you’re seeing an optical illusion: it looks impossibly large, given the Jetta’s overall size. Just watch the trunk when it’s open though: failure to push the trunk all the way up may see it drop down at random, causing you to take some sheet metal to the cranium. The interior impresses from a glance. Gorgeous instruments are all-digital on higher-grade Jetta models like my tester, and they flow into a gorgeous central touch display that’s logical, powerful, and very responsive. This interface is top notch: it’s simple and as straightforward, easily learned, and uses proximity sensors to only light up certain on-screen functions as your hand approaches, reducing display clutter. The display is colorful, detailed and high in resolution, and there’s absolutely zero lag or slow-down. On visuals and responsiveness, both the instruments and central screen used here blow anything at this price point clean out of the water. Other notable features include heated and chilled leather, power everything, automatic everything (including automatic wipers!) remote start, Bluetooth, radar cruise, a backup camera, a great big sunroof, and a punchy and premium Beats audio system that will turn your eardrums into gooey syrup. The cabin includes embossed leather, wood and aluminum accenting, and plenty of modern-looking gloss black. It feels like you’re stepping into a pricier car. Still, some of the cabin uses cheap plastic, and a few too many of the consoles and switches haven’t been updated. 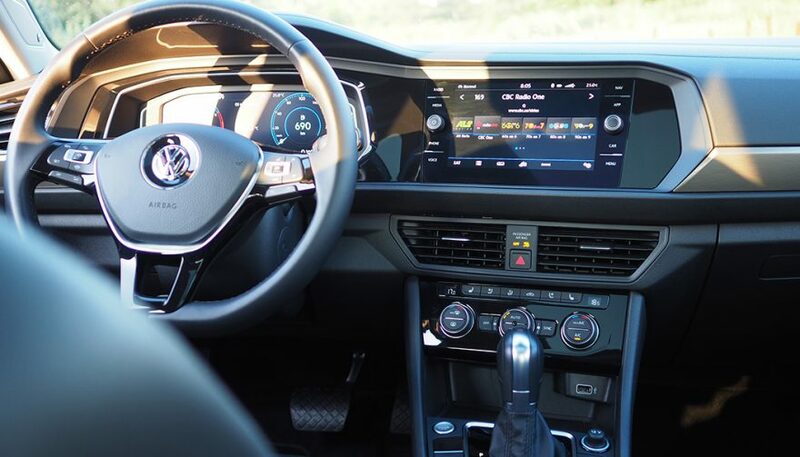 The window switches, mirror adjusters, and climate control console will be highly familiar to owners of older modern VW products. But as a whole, and in in no uncertain terms, the new Jetta’s digs reflect the demands of today’s shopper, and a long-time expectation of VW fans for an interior that feels pricier than it is. A 1.4 litre turbo four-cylinder sends a modest 147 horsepower to the front wheels. This engine is all about fuel economy: it won’t please the performance enthusiast, though it’s practically invisible, rarely makes a sound or any detectable vibrations or harshness unless opened up, and it comes with an idle-slashing auto-stop system that’s the smoothest I’ve ever used. My tester ran an 8-speed automatic for invisible gearshifts and low cruising revs, and gloriously, a six-speed manual is available—even on the top-dog Execline model. The ride is typically excellent. It isolates occupants very nicely from most of the undesirable sensations from the road beneath. It’s totally comfort-first. 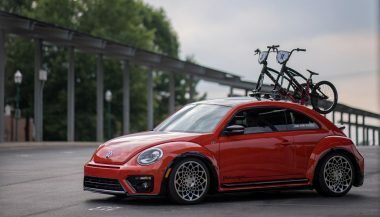 It doesn’t ride like the shocks are made of boiled spinach, though it seems VW engineers have accepted that this is not a car for the performance buff, and they’ve accordingly tuned it for one of the best highway drives for the money. Typically, Jetta floats along, and noise levels are kept appreciably low provided you’re on smooth pavement. If you blindfolded me, took me for a drive, and told me I was in an Audi or Cadillac, I’d probably believe you based on the ride and noise levels alone. Even whacking the sort of pothole that makes you bite your own eyebrow hardly breaks the Jetta’s composure. Note though that interior noise levels are at the mercy of the surface beneath. Though the cabin stays quiet to well above the speed limit, certain rougher textures of pavement passing beneath can cause a rapid spike in road noise seeping into the cabin. A drive mode selector can be used to alter or customize the way the Jetta feels and responds. The SPORT setting was my favorite, since it makes the driveline less lazy, and heavies up the steering for a more bolted-down highway feel. And the steering, like the powertrain and ride, is buttery smooth and never transmits much of anything back your way. Overall, Jetta’s main appeal seems to be exceptionally careful fine-tuning of what sensations are allowed into the car, and which ones aren’t. The slight buzz and vibration through the driveline inherent of any vehicle is all but invisible here. 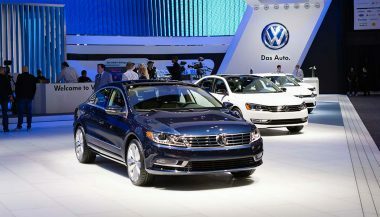 Jetta’s smoothness and refinement make many a competitor feel more brash, and this machine amounts to about the best example I’ve yet seen of a car that works to make you feel like your driving something far pricier. Performance is adequate at best, and if you’re someone who wants to hear and feel what the powertrain of your car is up to, or you want more than the 147 horsepower available here, you’ll need to go elsewhere. Here, the Honda Civic Sport Touring might be a better choice: its small turbo engine delivers about 30 more horsepower, and feels much more eager, even if it’s a noisier and less-refined driveline. Also, Jetta’s cabin, though super modern, is let down by some of those dated controls and consoles. And the brakes, though powerful enough, feel a bit sludgy when initially pressed. Finally, rougher pavement and broken roadways can knock ride quality and refinement back several notches. Head to the roughest road possible on your test drive to confirm. 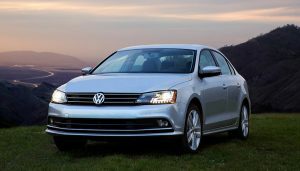 For those shoppers primarily concerned with space, top-notch comfort, very good fuel mileage, and more add-on content than a Billy Mays infomercial, the new Jetta should be considered a priority test drive in the segment. Volkswagen rolled out a fleet of VW concept cars that celebrate the brand's enthusiasts. From hot hatches to weekend warriors, everything is represented.